The lensometer Reichert AL 200 is easy to use so that any member of your staff can obtain accurate lens measurements with minimal training. Designed to eliminate the subjective nature of manual lensometer readings, the lensometer Reichert AL 200 reduces operator error and provides repeatable, objective measurements every time. 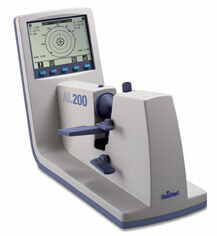 The lensometer Reichert AL200 is one of the most competitively priced auto lensometers ever made. It's never been so easy to step up to the convenience of an automatic! Are you done with the lensometer Reichert al 200? Go to lensometer.